Have a Solidoodle 2 3D printer and along with the 3D printing discovery process, I found a talented artist named Yan in Quebec, Canada. Yan's creations slice and print very well so I sent him a donation. He said he would design a 3D model for me and after pondering his talents and my historical interest in airplanes, we cooked up the idea of WWII nose art. Yan's creation is awesome and as I have not seen nose art rendered in 3D or sculpture before, I must say, this may be a historic rendering. My granddaughter calls her Betty Boom Boom. followed the original 3 channel (R/E/T) Radian which was very popular. mixing can provide crow, camber and reflex in addition to flaps. 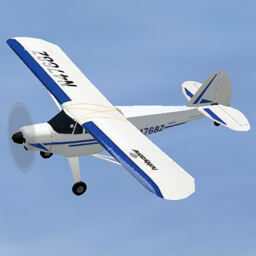 Another often requested sim model is the HZ SuperCub LP. Hope you enjoy flying it. 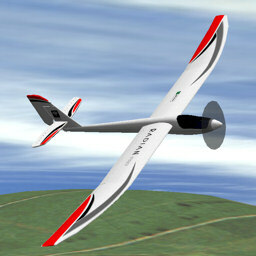 Here's my IPACS Aerofly webpage. 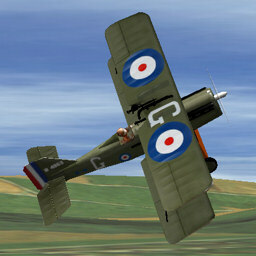 The reason I went with AFPD was I wanted to fly the many older EasyFly and AFP models too. 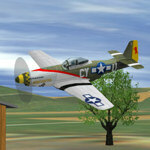 Aerofly 5 has brand new flight physics and will not work with the older models. And there is a great group of folks still creating models for AFPD. There is a steep learning curve for creating models in a new sim, so bear with me while I figure it out. 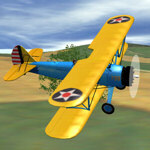 PT-17 Stearman in yellow and blue. This is one pretty model. yellow wings and grey fuselage. No extra stuff with this belly lander. Just chuck it and start flying. by Georg Gerdes in 2002 that was a good starting point. Thank you to Georg for his model. journey over to Clearview. We have a nice FMS beta8 model too. 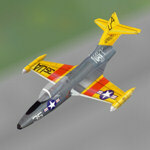 Once more I was able to rescue 145 FMS models from the bit bucket called the Internet. available. Ask me about that Steam Powered airplane. If you use the FMS sim, please browse through Pierre Gentil's recovered site. There are some beauties in there. Hopefully, I have found most of them and preserved them for others to enjoy. my blog when I finished them. So here's the ISD for FMS and RC Desk Pilot. motor. SGTalon says it always draws a crowd at the air field. Materials: Blue/Pink FFF and carbon fiber airframe. CG: should be around 24.25" from the nose. me know what changes need to be made. the towel easy build delta is gaining some awesome recognition. Here's the RCDP version of the towel and the FMS version too. compared to the real model. This is an unedited and uncut flight from my Radian at SEFF using the EyePod and an HD keychain cam. I found that some of the editing software makes the result worse so be patient through the startup and shutdown. Just completed the sim models for an Avro Vulcan. Please give one a try and I hope you enjoy flying it. this one a try and if you have the model, give us some feedback. this one fly yet, you are in for a treat. Links to videos included below.